The gardener's best friend. 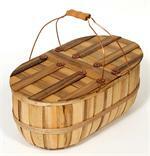 Our English style trug is the ultimate carrying basket. Strong, lightweight and stable. Simple elegance and function. A Wall St. Journal 'Gift Pick' for gardeners and the all-time favorite of our friends and family. Fashioned after the classic "bushel style" apple baskets. With a solid wood bottom, this basket is strong enough to tote tools into the garden and return loaded with the harvest. A pleasing counter top fruit bowl basket. Charming holiday theme basket too...just add flowers, fruit, Easter eggs, pine cones and it's an instant centerpiece! A family keepsake. Use the large size for a pie carrier or yarn basket. We designed this boat after the drift dories used on the rivers of the Pacific Northwest. The dory has been a big hit - It will put a smile on your face! And it makes a great bread basket too. Traditional hamper style leather-hinged picnic basket "a real American classic" is made of Oregon Myrtlewood and solid copper. 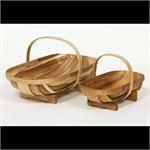 A basket for outings or beautiful roomy storage accessory in the home. Exceptional wedding gift. We appreciate all the great reviews! I am absolutely happy with the beautifully crafted garden trugs. They arrived within 2 days of the order, carefully wrapped in 100% renewable protective packaging. Solid proof that fine products continue to be made in America! The product was amazing, the customer service was outstanding. I will definately order again! Speedy and efficient service..The basket, I ordered, is beyond the description....it is fabulous! The baskets are beautiful. They are a work of art. I will order these again in the future. Thanks, Mary V.
I just received your beautiful Coos Bay Trugs. I am so glad to discover that such fine quality work still exists. The trugs are beautiful and I will treasure them. ...Remarkable delivery time! I am so happy. I needed them for cutting and pruning my rose garden. I will buy more and give them as gifts. They are superb, and I am overjoyed to have them. Yours truly, Barbara M.
This is the 5th Trug I have bought from you. This one is for my son's wedding. I can only thank you for making such a wonderful product that I am proud to give to family and friends. Art C. .
We build the baskets one at a time.... by hand, with Oregon Myrtle, a beautiful hardwood, solid copper nails and clear mineral oil for a stunning natural finish. True working baskets of heirloom quality.